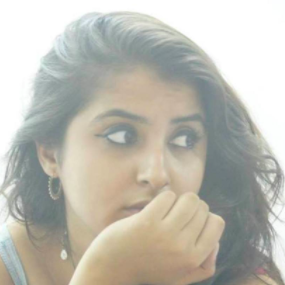 Plixxo influencer, Diipa Khosla is one of the biggest Indian bloggers out there. With almost a million followers on Instagram, the fashion and beauty blogger is at the top of the industry. She has worked with some of the biggest brands in the world including Maybelline, Next, Swarovski, and so many more. Diipa just got married to her longtime bae, Oleg E.H. Büller who was born and raised in Amsterdam. 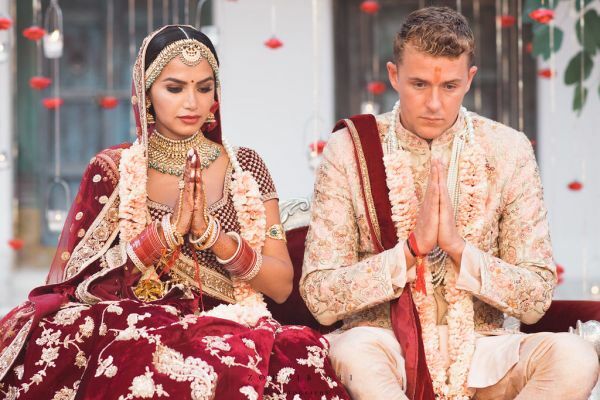 Because the lovebirds' wedding has been anticipated for a long time by fans, the two decided to host a virtual wedding. That's right, all of Diipa's fans were part of her big day and we think that's an adorable gesture. 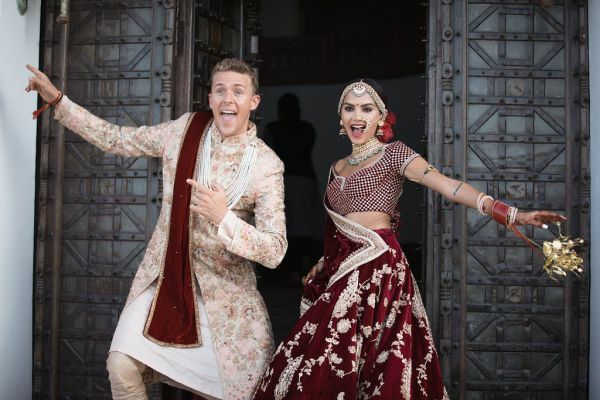 They released vlog style videos on Diipa's YouTube channel for each event, shared Instagram stories of the festivities and even shared photos and short clips of all the fun moments of the big, fat Udaipur wedding. 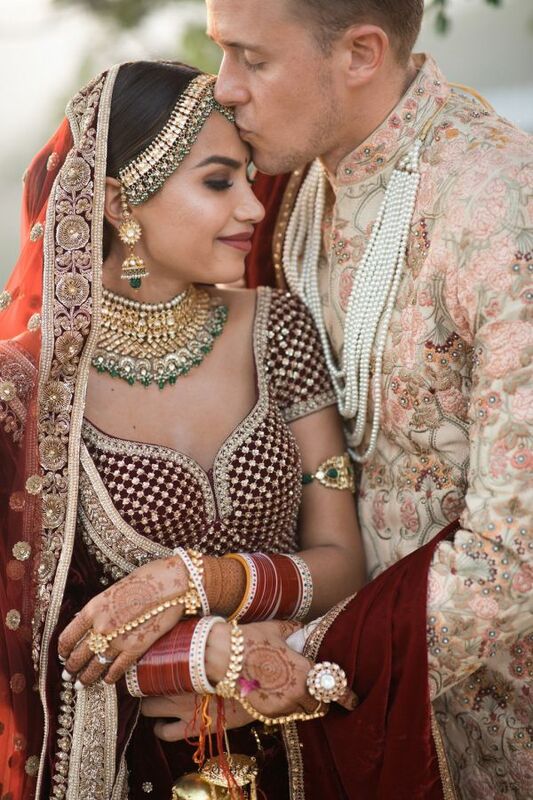 But, especially for you, we've got exclusive photos and behind-the-scenes fun from the #thebullslas shaadi and uff, this dulha-dulhan embody the role of prince and princess perfectly. Diipa chose to wear a floral Sabyasachi saree for the first day of her celebrations and looked all things glam in a chic bun with bangs. Her jewellery was by Amrapali Jewels and chose to wear a single statement kundan choker. 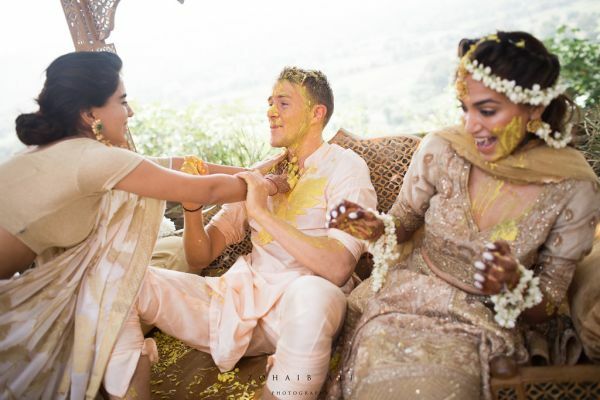 The dapper groom's outfit was from Varun Bahl and the pink motifs subtly tied in with Diipa's pink flowers. We love us some cutesy deets, don't we?! And let the madness begin with the sangeet! 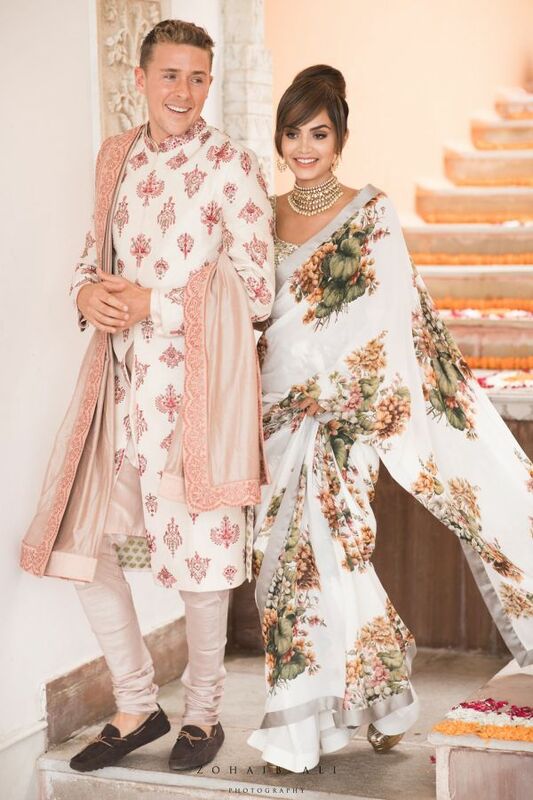 For the sangeet function, the influencer chose to wear a very unique Indo-western custom made Anamika Khanna ensemble. 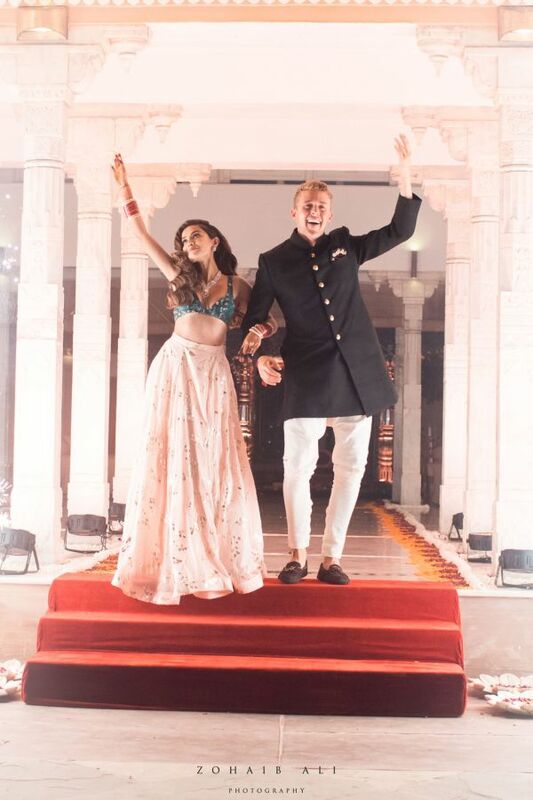 It was a detailed pastel lehenga that also had pants underneath. She paired it with minimal jewellery, going only for dangling earrings and an armband. 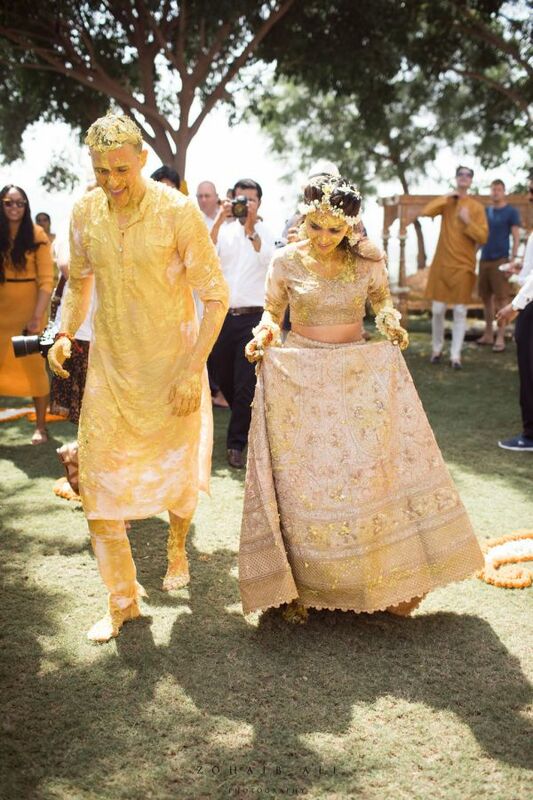 For the haldi function, the couple chose to compliment each other with wearing similar shades of cream. The bride-to-be chose a golden lehenga by Ritu Kumar and went with gorgeous, fresh floral jewellery. 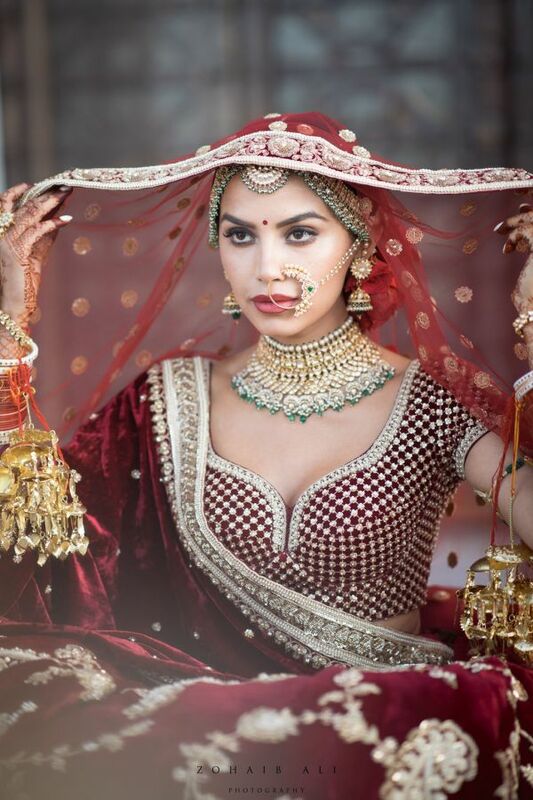 Diipa did the plunging neckline just right on her chooda day and went for a Mani Jassal lehenga. Because the colours were bold on the outfit, she went for a neutral but flawless look for makeup. She rocked an emerald and kundan choker as a statement neckpiece and even added the classic Indian touch of a bindi. 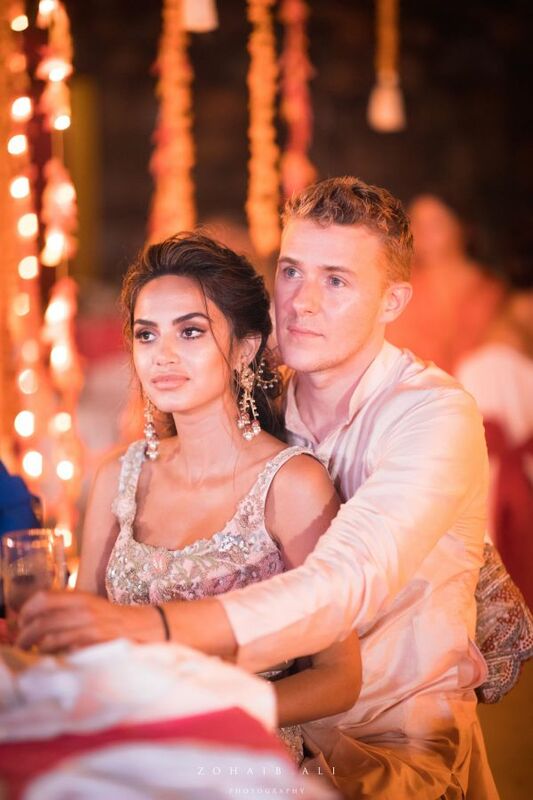 For the main wedding function, Diipa looked like absolute royalty. 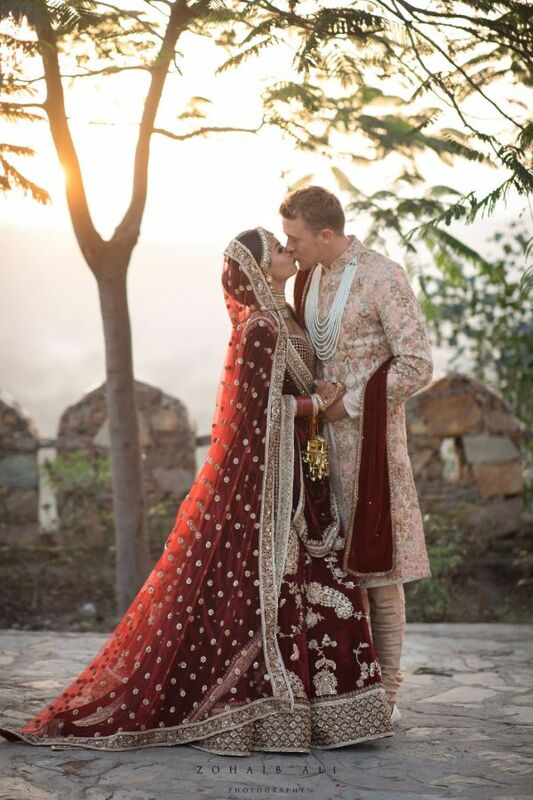 She chose the ever-classic Sabyasachi maroon and gold velvet lehenga. The details were floral zardozi work and we're in awe of this stunning princess. The dulha complimented his bride with a cream floral sherwani and a marron stole. She again wore Amrapali Jewels in green and golden to provide a beautiful contrast. The matha patti also was a part of the same set and the whole look tied together majestically. 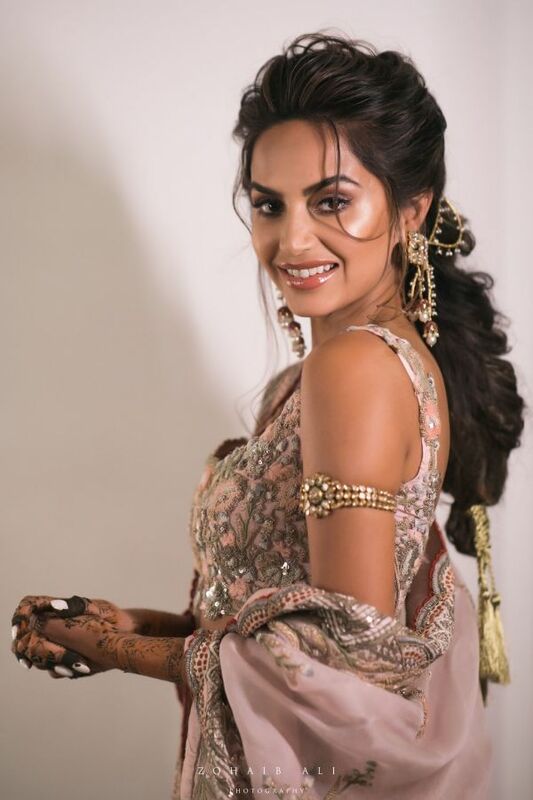 For the reception, Diipa again gave an ode to her love-affair with lehengas. She went for a fully embellished grey and gold outfit and dazzled through the night. She finished it off with adding some more glitter and shimmer with a dimond necklace and earrings. Oleg also went for a classic black sherwani for the night and looked every bit the knight in shining armour. Later, the bride even had a quick outfit change and dressed into something lighter- cream skirt with a teal blouse.